This waterfall is located about 20 km, 30 minutes from Kediri City. The fabulous mountainous scenery of Besuki-irenggolo has is ready to see. Besides, here the tourists can find some interesting things, such as; shady natural pine forest, playground, camping ground, hiking and jogging area, etc. 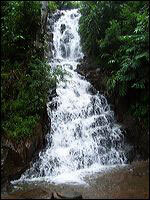 Enjoy its fresh and cold airs in this waterfall that will bring you feel comfortable to breath. There are many trees that add its greenness and beautiful scenery for your eyes.